Born in Riga, Latvia, Lia spent many of her earliest years foraging and fishing the nearby woodlands with her family. Her early relationship with Nature has remained a constant thread in her life. At an early age, Lia was drawn towards working with young children and has been an early childhood educator since 1989. She has been fortunate to have had wise and skilled mentors in both early childhood education as well as nature connection. Lia has taught in a variety of settings including small and and large preschools, a Waldorf kindergarten, a parent cooperative, and wilderness programs. In 1996, Lia founded her first preschool, Seedlings, and in 1998 she opened Wild Roots Forest School, a preschool and kindergarten roofed by the sky and carpeted with the living woodland floor. In 2010-11 Lia directed Orca School, a Waldorf inspired k-8 school with nature immersion at its center. Lia is an accomplished storyteller, parent educator, naturalist, and herbalist and teaches classes and workshops in all of these areas of study. She is co-founder and presenter of the annual Reaching Nature Connection Conference and co-founder of the Academy of Forest Kindergarten Teachers. Lia resides in Santa Barbara, CA with her musical husband, Jim, her two, nature-immersed, tree-climbing sons, and their three cats. Wendolyn, as a single mother, birthed Tender Tracks Tales & Trails out of a desire to be at home when her children came home from school as well as to making a living working outdoors. Having been brought up traveling around the country in a camper van exploring nature’s bounty in it’s many stages of glory for vacations & having a Mother that took dozens of Girl Scouts out on hiking adventures regularly, Wendolyn found herself following in similar footsteps. In 1996 she began her first summer camps and the following year her 100% Outdoor Preschool in Palo Alto Ca. Tender Tracks continues on now in Fairfax, CA. Ilana Israel was born and raised in Santa Monica, California. She has fond memories of playing outside as a child and feels fortunate to have had those experiences, exploring and enjoying the outdoors with her parents and brothers. Ilana moved to Northern California in 2008 to pursue her education. While attending school, she worked in preschool settings, many of which were inspired by the Reggio-Emilia approach out of Italy. She quickly saw the value in play based learning and what it means to support a child’s social-emotional development. After teaching with Megan Dusablon for a few years, they co-founded Parks Plus Creation in 2013. Ilana strongly believes in respecting each child as an individual and supporting them in opportunities of risk management and discovery in the outdoor classroom. One of her favorite things about teaching outdoors is seeing the children’s independence grow through navigating the natural world. She holds a B.A. in Child and Adolescent Development and has worked with preschool age children and their families since 2004. She now resides in San Francisco, California. Megan grew up in Vermont and cherishes the memories she has of playing outside with her siblings and neighborhood friends making mud donuts, climbing trees, drawing and swimming. Growing up, her family cared for many creatures, sparking her fascination with animals large and small. It is on and off trails, crossing creeks and playing in the snow in Vermont where her nature connection began. Megan believes that these early, positive outdoor experiences are crucial in developing a connection to nature and a lasting love for the Earth. Outside, children are free to explore their imaginations and challenge their physical capabilities, building confidence, creativity and resiliency. Megan has worked with children since 2006. She received a BFA from Lesley University. In Boston, she volunteered to bring studio art programs into elementary schools. She moved to San Francisco in 2008 and attained her Early Childhood Education credentials. After working as an atelierista (art studio teacher) in a Reggio-inspired school, Megan was immediately drawn to the approach and philosophy of Reggio Emilia. Holding the child at the center of learning and combining her love for the natural world, Megan partnered with Ilana Israel in 2013, to form Parks Plus Creation. Parks Plus Creation offers nature connection programs for children and families in San Francisco, including a forest preschool, called Spire School. Megan, her husband, Kevin and their daughter live in San Francisco. I have been an early childhood educator since 2000. It has been an honor and a pleasure to have been part of the lives of so many families and children. I believe that early childhood is the most influential time in anyone’s life and also the time when families need the most support. After academic training in child development/early education and working for a decade as an infant/toddler and preschool teacher, I had the amazing opportunity to serve as the Director of Esalen Institute’s Gazebo Park Preschool & Infant Toddler Center. There I had the opportunity to participate in the most inspiring approach to early education I had witnessed world-wide. The Gazebo model combined mindful communication, extensive ecology education and play-based curriculum. In 2013 I opened my first preschool program, Early Ecology Forest School in Oakland, CA. I knew that the children growing up in the urban environment deserve the same opportunity to a natural childhood that we were able to nurture in Big Sur. Early Ecology Forest School continues to thrive serving over 60 families a year. After giving birth to my son, I was fortunate enough to move back to the redwood, bay and oak forests where I was raised in beautiful Santa Cruz where I opened Happy Valley Nature Preschool. Formed by the San Gabriel Mountains, and the Santa Ana Winds, Liana spent her childhood exploring the rich colors and textures of Southern California. From playing chase with tumbleweeds in the Mojave Desert, to investigating decomposing animals in her East LA neighborhood vacant lots while wearing the dried surf on her skin after a morning on the beach, Liana’s relationship with nature in all its forms have been a lifelong source of reverence and inspiration for her. 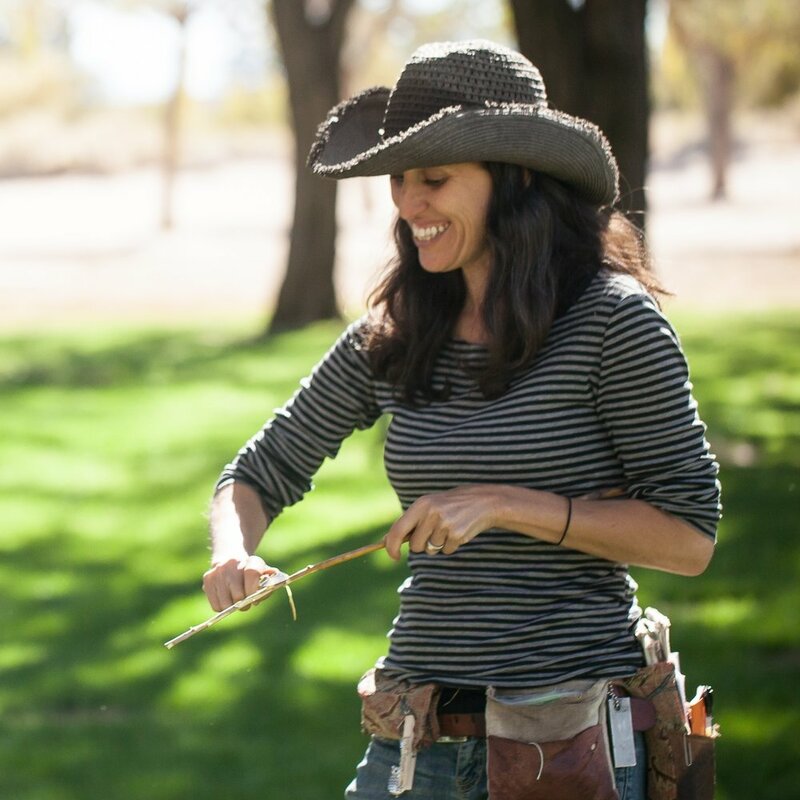 After studying child development, art education, and graduating from California College of the Arts with an emphasis on textiles and Earthworking, Liana began to combine her passions which brought her to the mossy and wonderful world of forest school. She has been working in early-childhood art and nature programs since 2002, and founded Berkeley Forest School after the birth of her son in 2011. Liana remains passionate about increasing access to the benefits of forest school to under-resourced communities, and in 2017 founded Earth For All to grow this mission to supplement disaster relief in regions that have experienced collective trauma and displacement. Liana partners with public health organizations to offer the practice of forest school as a vehicle for emotional healing in connection with the land. Susan grew up in a rural town in Virginia. From a young age she was grateful to have space to roam and explore. Some of her fondest memories were playing hide and seek in the forest, catching tadpoles and playing outside all day. This love of nature continued on into her adult life taking her on many traveling adventures. The biggest adventure was becoming a parent to two amazing boys. Susan has been working with children and families for the last 13 years. She is the founder and lead teacher of All Friends Nature School. Susan has a genuine appreciation for the outdoors and is passionate about teaching young people to have a meaningful connection to nature and the world around them.